There are those whose impact in the NHS is felt in their working role, and there are those whose impact is felt through what they bring to the NHS outside of it. Donna Mighty does both. 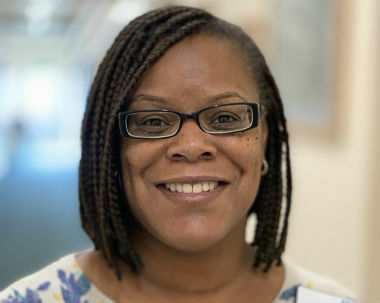 Living just a stone’s throw away from Sandwell Hospital, Donna joined Sandwell and West Birmingham NHS Trust in 2016 as Assistant Primary Care Liaison Manager. It is a role which sees Donna travel frequently, acting as a facilitator between the Trust and GPs from 85 practices. “No two days are the same,” said Donna. “It’s a role that sees me developing our relationship with the GP practices across the area and ensuring that communication is always as clear as possible. Donna is aided in these tasks by her “wonderful and supportive” line manager, Dottie Tipton. Outside of her main role, however, Donna is influential in a whole other way. She is the Equality Officer for Unison and current Chair of the Black Minority Ethnic (BME) Staff Network which she helped set up. “The work of the BME staff network helped us to celebrate Black History Month in a way like never before in 2017,” she explained. During 2019, we are taking the ‘Here to Stay’ exhibition on tour to Liverpool, Warwickshire and London. This year Donna was approached to be a judge at the annual Health Service Journal (HSJ) awards – one of the leading award schemes in healthcare. A passion for equality was instilled in Donna by her own hero – her mother, who she describes as a strong woman with a big heart, a really positive role model and, above all, kind. A passion officially recognised last year in the Star Awards when she became the Equality and Diversity Champion. A mother herself to a fourteen year old daughter, she is humble about her own impact at SWBH. “I can’t fix everything.” She shrugs wistfully, “But I’m playing my part and doing my little bit.